The 1980s have become a fashionable cabbage patch for musicians to pluck ideas and sounds from, which is ironic since many consider it the be the most artistically devoid decade of music. While most '80s revival bands are content to just incorporate elements, Danish group, Reptile Youth seem set on actually sounding like they're in the '80s. Listening to "Black Swan," you can easily picture its early-MTV music video, with the band performing in a black box, colorful lights burning halos on the screen, intercut with the lead singer chasing a curly-haired sexpot through the dampened streets of Copenhagen. Sadly, it's the crowning achievement of the session. "Gimme Some Truth" reminds me too much of They Might Be Giants' "Money for Dope," and "Dead End" is laughably bad, with its grandiose biblical lyrics and disco drums. Download "Black Swan" if you love the '80s, but toss the rest. 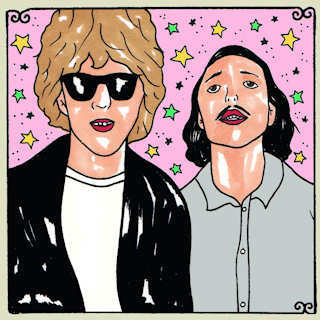 Relive the '80s and more with an annual Daytrotter membership.